I have tried a couple recipes lately that I was disappointed in, which is never fun. You feel like you have wasted time and money on the ingredients, not to mention not getting to enjoy a yummy dinner! Well, this was just the change I needed to get me wanting cook again. I saw this recipe on The Sister's Cafe and couldn't wait to try it. It is perfect for lunch with girlfriends and for dinner too (I grilled some chicken to go with it for dinner). I will definitely be making it again soon and I loved my addition of the black beans because it made it a little more filling. SOOO good!!! I'm one of Chrissy's Fremont friends and I've been following your food blog for quite awhile now... I'm amazed at everything you get done, girl! Anyways, this salad is AMAZING. 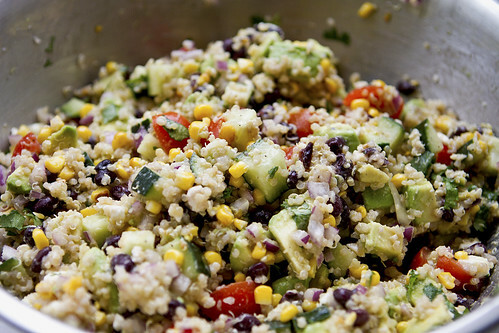 I've tried several quinoa recipes that I like, but this one takes the cake. Seriously, I hope there's some left by the time we eat dinner! Thanks for sharing this. Thanks Melissa! I'm craving it again already :-)!